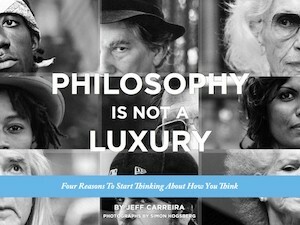 I wrote this eBook as an exploration of the profound utility of philosophy. And it is rooted in the same conviction in the fact that philosophy is not a luxury, that has inspired me to write blog posts each week for almost four years. Today I am happy to offer you a free copy of the book in appreciation of your own love for philosophy. Please click on the link below and enjoy! Click here to receive your free eBook. This is not a collection of ideas to adopt. This is not an instruction manual for inquiry or a collection of philosophical ideas to adopt. I have not written it in order to tell you what to think, but to give you some things to think about. In doing this I am following a Romantic sentiment that recognizes that the value of writing is not found in the words, but in the truth they provoke in the heart and mind of the reader. The world is not the way you think it is. We don’t know, and yet we have to act as if we do. The circumstances around us are changing faster than we can. Each of these statements is presented as a good reason to think about how you think. Give less of your attention to the words on the page and more to where the words can take you. Follow your own understanding, not mine. Register here to receive your free eBook. My first intention in writing this book is to give you some things to think about and to create a context for thinking about how you think. My second objective is to educate you (especially if you happen to be an American) about some of the ideas that are part of the rich tradition of American philosophy. My advice is to read vulnerably, not critically. The American character is diverse and somewhat contradictory, but one trait generally associated with it is pragmatism. Americans like things that work. That might be why the “love of philosophy” is not one of the characteristics most often associated with Americans. And it is probably not surprising that the greatest American philosophers have all insisted that philosophy is only worthwhile if it serves as a tool for living better lives and facing life’s challenges. The philosophical ideas most discussed in this book are those held by the classical American philosophers Charles Sanders Peirce, William James, and John Dewey. These three brilliant minds were the originators of the philosophy called pragmatism, which remains to this day America’s most significant contribution to world philosophy. The essays included here represent a general progression of thought, each building upon the last. I suggest, however, you read them as complete in themselves and see what questions and avenues for further inquiry they open up for you. Each essay is a snapshot, a glimpse into an extraordinary perspective on reality. They are seeds for contemplation, starting points for your own inquiry.